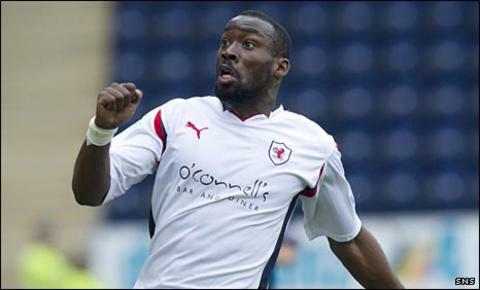 Gregory Tade has agreed a one-year contract with Inverness Caledonian Thistle after the French forward was released by Raith Rovers. The 24-year-old says he rejected other offers after Rovers narrowly missed out on promotion to Scotland's top flight. "There were other clubs interested, but - no disrespect - it was a no brainer for me to go to Inverness," Tade told the Scotish Premier League website. "I see this as a reward for what I did last season." Nantes-born Tade, who has an option of another 12 months at Caledonian Stadium, has spent most of his career in Scotland, having joined Forfar Athletic in 2006 after leaving Orvault Sports in his homeland. He moved on to Stranraer, Clyde then Raith Rovers in 2009, helping the Kirkcaldy outfit reach a Scottish Cup semi-final in 2010 and this season finish runners-up in Division One. Now he hopes that working under the Inverness manager will help him become a hit in the SPL like Adam Rooney, the former Stoke City 23-year-old who attracted rave reviews last season. "Everybody knows Terry Butcher is a big man of football," said Tade, who had been linked with Dunfermline Athletic, Hibernian and St Johnstone. "What he has done with Adam Rooney has been great. "I thought he was the right fit for me. He has shown interest in me for a long time and, when someone keeps scouting you, it shows they really want to work with you. "I came to Scotland when I was 19 and knew I had a lot of work to do to achieve my goals. "I wanted to get to the SPL one day and I'm happy I've got the opportunity to do so."